In a world where popular musicians, especially female ones, face increasingly vile resistance from "fans" who feel an inflated sense of ownership over them and are emboldened by the visible anonymity of the internet to say so, an artist looking to explore or expand her musical horizons must suffer the protestations and abuses of proprietary fans afraid of change or insecure in their own taste. The latest and most publicized example of this sort of brouhaha surrounds Lana Del Rey, which before it became a cause celebre/opportunity for condescension (either to her on one end or to those who condescended to her on the other) was simply the collective bitching of a segment of Lizzy Grant fans whose feelings were hurt when their little hipster darling went - *GASP* - mainstream. 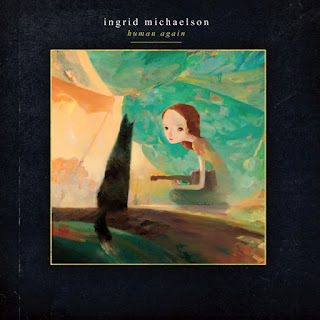 While nowhere near the degree faced by Del Rey, such is some of the current ridiculousness the cult fave Ingrid Michaelson faces in the wake of her splendid, engrossing sophomore LP Human Again. On the album, Michaelson, to great effect, augments her trademark idiosyncratic realism with minimalist elements of contemporary electronic production techniques, thus breaking the confines of the ho-hum Lilith Fair '98 singer/songwriter identity (overtly and by suggestion) and opening herself up to a wider audience without abandoning any of what makes her such an appealing musician. Ingrid Michaelson began her career as something of the cute/happy/quirky little sister to artists like Vanessa Carlton, Sarah Maclachlan or longtime friend Sara Bareilles. She wore glasses and played the ukelele and sang lyrics like "I'd buy you Rogaine when you start losing all your hair." That's a line from her breakout hit "The Way I Am," which entered the general consciousness via an Old Navy sweater commercial. All together now: "awwww!!!" After Bareilles' surprising and excellent second album Kaleidoscope Heart, which displayed a marked advancement in skill, confidence and willingness to play in the studio a bit and debuted at #1 on the Billboard 200, Michaelson released a cover of a song she'd written for UK pop singer Cheryl Cole called "Parachute," and that's when the murmuring began. Michaelson had long been performing an acoustic rendition of "Parachute" in her live shows, which are renowned among fans and fellow artists, but the digital single differed significantly from that style as well as from Cole's tango-inspired cut. It was a glorious, thoroughly polished studio production, gleaming like an apple with a bit too much wax (not, however, in the lifeless, fascist, Auto-Tune-gone-wild way of, say, Glee Cast covers), and I for one fell in love. I hoped excitedly that it indicated something of a new direction to be taken on her subsequent album. Some purist fans had rather the opposite reaction, missing the point of the inherent differences between recorded and live performance and complaining about a supposed loss of the authenticity and intimacy that Michaelson so adeptly brings to her concerts. Because Michaelson and her producer Dave Kahne (Sublime, Regina Spektor) don't use standard, predictable sounds and effects, it's not transparent production, but it's not meant to be: in most cases, listeners are supposed to notice the production elements because they're part of the story, or at least the storytelling, evoking some mood, surprising the listener in order to underscore something in the theme or the lyrics, causing a thought or emotional reaction that turns out to be useful in the context of a phrase or the song around it. On the hopeful closer "End of the World," muted brass undulating in the background suggest a ship at sea or something similarly suggestive of a voyage, which lends poignancy to an already emotional song. It also hearkens back to the song two tracks previous, "In the Sea," which itself sounds more like an infantry's march to battle across dry land than a journey aquatic - and this in turn reminds the listener of an even earlier track, "This Is War." If "In the Sea" featured the oceanic horns and "This Is War" the drumming of soldiers, it would be appropriate but predictable, and the music would not have the impact that, for instance, so intrigued me that I would write an entire paragraph on the matter a full three weeks after first listening to the album. The quality of the recording is clean and rich enough for the detail and delectability of the minimalist production to have full effect on a captive listener. Even the acoustic "How We Love" has the kind of clarity of sound I often missed on parts of Adele's 21, an album that utilizes subtle and unorthodox production techniques and simplicity to similarly strong effect. The two albums aren't terribly dissimilar, actually, although where 21 is about anger, pain and destruction, Human Again is about disappointment and hope, and where Adele is rarely what one would call subtle in her delivery, Michaelson is a master of understatement. Good as it is, Human Again is not, of course, entirely flawless, although its few faults can be easily excused by those of the view that all's well that ends well. Human Again, like its cousin 21 and half-sister Kaleidoscope Heart, is a "breakup album," and unless an artist enjoys the Pyrrhic benefit of a public enough existence for listeners to know of an artist's authentic inspiration for such themes already, the concept only really works if the artist can make the experience believable. No one wants to listen to a breakup album by someone who's never experienced the unique horrors a real-life split involves (Robyn may be the exception). Given Michaelson's exuberant if positivity (granted, my familiarity with her prior work had been limited, but one has to play to the rafters as well as the front row) I found it briefly difficult to fully buy the breakup album conceit on Human Again - that is, until the fourth track, "I'm Through," a devastatingly beautiful, wounded ballad (over spare piano and acoustic accompaniment) to which I dare anyone who has lost a love to listen and not be moved. Even then, though, Michaelson isn't just playing the sap - I found myself inexplicably smiling, comforted even, despite a small tear that made an obligatory but transient descent. From that point on I was able to appreciate the musical intricacies of the remainder of the album, freed as I was from distracting doubts about believability - even on subsequent songs that come off less obviously genuine. Otherwise it might have been harder to appreciate a lyric that so flagrantly straddles the line between clever and obnoxious as "We hate the rain when it fills up our shoes/ But how we love when it washes our cars," or to smile when she earnestly asks, "At the end of the world, will you find me so that we can go together?" I much prefer the uplifted feeling I took from my first run through of Human Again to disgruntled incredulity, and certainly to some stubborn annoyance at a little electronic residue and accompanying essence of - horror of horrors - pop music! Ingrid Michaelson has clearly succeeded with Human Again in numerous ways, and I am living proof. With this expertly constructed album she has successfully converted a very casual admirer to an album buyer and newly integrated fan with every intention of purchasing future albums and even the occasional concert ticket hereafter. I know of plenty of Michaelson fans who love the album as much as I do, and I can't be the only fan Michaelson has newly won. 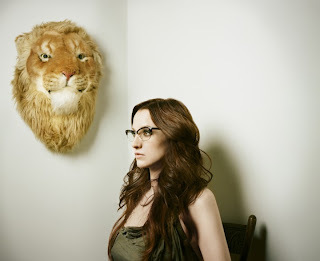 To longtime fans as well as to those who share my wariness toward the girl & guitar/sensitive singer-songwriter genre, I highly recommend giving Ingrid Michaelson's brave little indie-pop album a listen. You might find it as unexpectedly rewarding as I have.